This is the art sculpture, titled Home Run, located on the roundabout at the intersection of 116th St. and Hazel Dell Parkway. Junior Vivian Werstler lives right next to this roundabout and said she agrees funds should go into roundabout sculptures, mentioning she hopes Carmel will continue building these pieces of art despite some negative response from citizens. 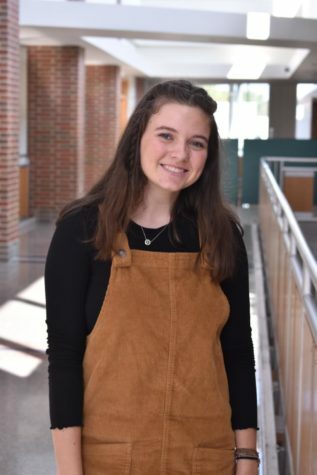 After living in Carmel, a city well-known for frequent construction and dedication to improvement, the recent installment of new pieces of public art in the center of roundabouts came as no surprise to junior Vivian Werstler. 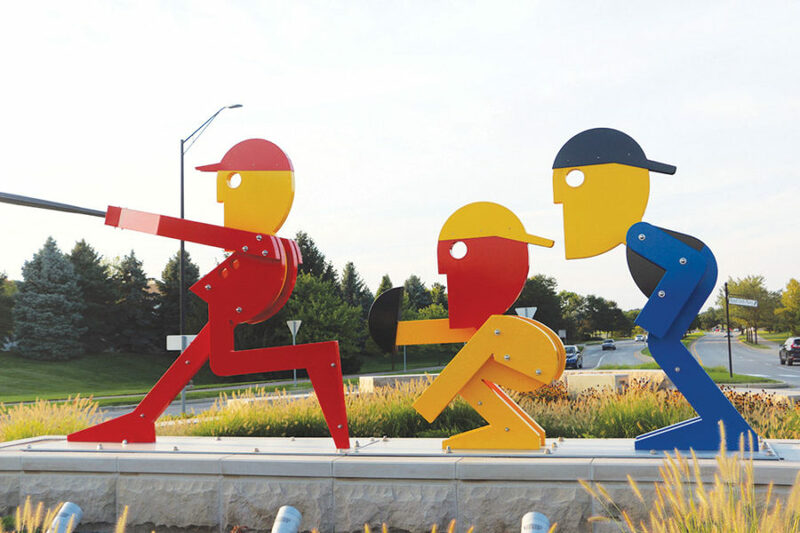 From depictions of figures playing sports such as soccer and baseball to abstract sculptures, these new art pieces seem to be the latest project for members of city government in their continued search for enhancement. For the most part, citizens seem to applaud the dedication. 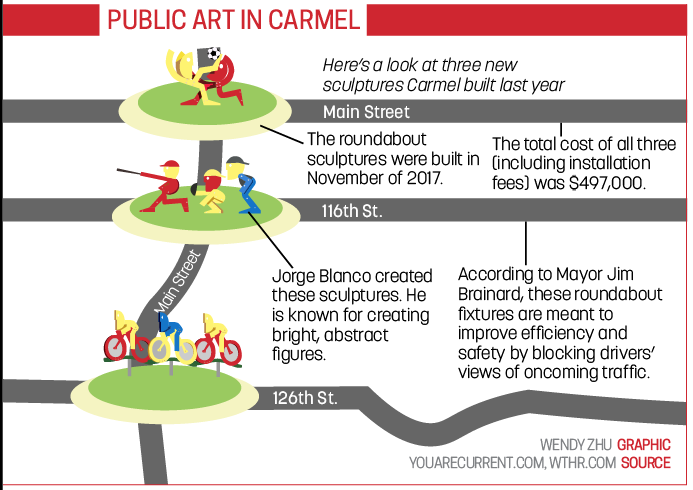 Werstler, an artist living right next to the Hazel Dell roundabout with a statue of figures playing soccer, is one of these Carmel citizens who appear to be on board for the renovations. According to Carmel Mayor Jim Brainard, the visual aesthetic of the various sculptures plays a major role in the reasoning behind the installments. While creating art with visual appeal was the main goal, there are still many citizens who said they feel unsatisfied with the new additions. Among them is junior Natalie Crispin, who said she wishes the city had left the natural landscapes that used to reside in the center of roundabouts. “A lot more people enjoy looking at (flowers and trees) rather than random statues that have no meaning and are not very visually appealing,” Crispin said. Aesthetics aside, there are other important considerations when it comes to evaluating these artistic additions. According to Fox59 News, the three sport-playing sculptures that now stand in the middle of three separate roundabouts cost $487,000 in total with an additional $10,000 for installation, what may appear to some citizens as an excessive amount of money to spend on art pieces such as these. Brainard, however, said Carmel citizens have some of the lowest property taxes in the state, a fact, he said, that softens the burden of these costs. “We feel confident that our investment into cultural arts of all kinds is not only affordable but good for the city and helps us attract business investment which keeps our taxes low,” Brainard said. For the citizens who support the sculptures, the additional costs do not make the art any less appealing. To add backing to Werstler’s stance, in an article written by Paul Konz and published by the National League of Cities, Konz found that investment in culture and the arts are more economically beneficial to a city than even tourism or transportation. In their 2017 State of Cities report, they found that for every dollar a city invests into public art, there are $6 in taxes produced. Not only this, but the arts have shown to improve almost all city issues such as public safety, infrastructure, and health. Werstler said she fears members of city government will not continue to establish art pieces such as these because of negative societal responses; however, many other citizens, such as Crispin, said they believe local government will pursue these artistic advancements further, as evidenced by the recent addition of the greyhound cut-outs lining another roundabout on Main Street. Whether the majority of people enjoy the new sculptures or not, Carmel’s government stands firm on its dedication to the arts.